Some vendors call these beads "mouth blown". But, actually, in the first stage there is a tube made by fusing and pulling many mosaic canes of Murano glass. 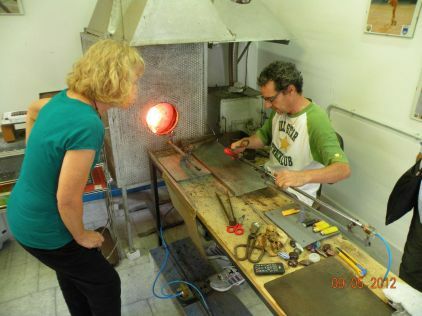 (In the photo, Susie observes our Murano glass master at work.) Take note of the blow pipe that the glass master holds in his left hand. There is a blue tube proceeding from the end. Unseen in this photo is a compressor, under the table, that is activated by his foot. He uses the foot pedal to apply pressure to "blow" the air into the glass. In one stage of the bead making, the craftsman pinches the end of the tube, allowing the molten glass at the end to expand into the desired shape. It is worth noting that this particular Murano glass master, is given credit for inventing this method. Once the bead is made and cooled, the outer layer is ground off to expose the mosaic multicolors. These blown Murano Glass beads are the most beautiful we have ever seen; truly "works of art"! The multicolored (Multicolore) glass designs are the most intricate, detailed, and time consuming beads to make by hand. Handmade in Murano, Italy. We are the first company to show these multicolored mosaic, blown Murano Glass beads on our website. If you see them elsewhere; they copied us, Alexander-Lee Gallery, in business since 1976.